PenMount continues to release third generation PenMount projected capacitive (PCI or PCAP touch) controllers. Our proprietarily developed PCI controller firmware, software, and hardware possess functions that surpass products on the market and we provide total PCI touch solutions that allow customers to successfully design new products. PCI applications differ from resistive touch. In terms of physical structure, PCI technology lends itself to beautiful true-flat design and its glass surface is scratch-resistant while conducive to the application of optical treatments. However, if product features are not designed comprehensively, PCI touchscreens are susceptible to noise interference from the external environment. Resistive product functions are not affected by water on the touch surface but the same liquid on a PCI touch surface will interfere with the touch signal and requires special firmware recognition and handling to prevent false touches. PenMount’s PCI controllers have fully resolved many hidden PCI touch issues. PenMount’s third generation P2-08 controller is suitable for PCI touch products larger than 8.4″. Incorporated into the PM1310, PM1410, and PM1710 control boards and paired with PCI touch panels between 8.4″ and 24″, the P2-08 provides sophisticated features that allow PenMount PCI touch products to lead other controller specifications. For PCI touch panels smaller than 8.4″, PenMount utilizes the P2-06 controller primarily on a COF (Chip on Flex PCB) control board paired with a PCI touch panel. Currently, the PenMount PM2203 COF controller has been introduced to support PCI touch panels between 5″ and 8″. Customers can choose between USB, I²C, and UART interfaces. We have specially designed interference handling circuitry into the PM2203, making it suitable for a number of customers’ operating environments. 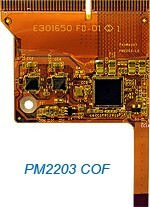 The PM2203 is a brand new third generation controller product. Its firmware and algorithmic performance is similar to large-sized PCI controllers, featuring 5-point touch and supporting glass thicknesses of 1.1mm, 1.8mm, and 2.8mm. At the same time, the COF structure itself easily passes EMC Level II standards. PM2203 firmware design is paired with the latest PenMount PCI water recognition technology in the form of WD (Water Detection) and WP (Water Performance) modes which allow this product to be utilized in industries where water or saline is prevalent during touch operation. Certain market requirements for small PCI applications such as handheld products that must pass medical safety certification, Point of Care (POC) devices, automobile touchscreens, etc. can utilize the PM2203 COF controller paired with an AMT PCI touch panel. This touch solution not only satisfies customer requirements but also allows customers to quickly fulfill the demands of applicable markets and create win-win results.